Do you ever get sick of the daily frustrations of riding a bicycle in Chicago? Lousy pavement and overly wide roadways, which are plagued by speeding and lack green space, spring to mind. 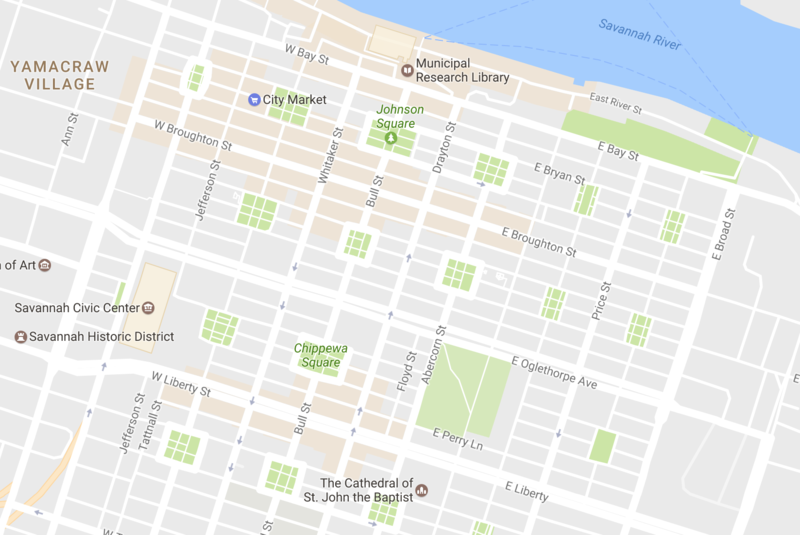 If you ever have a chance to travel to the Southeast, I’d recommend checking out Savannah, Georgia, a historic city of about 145,000, located a stone’s throw from the Atlantic coast, and separated from South Carolina by the Savannah River. The tranquil, leafy streets of its large National Historic Landmark District, with mellow car traffic and plenty of bike activity, are a perfect antidote to the stresses we tend to take for granted when cycling in Chicago. That’s not to say all of Savannah is a pedaler’s paradise. As you get farther from the city center, the grid starts to break down, and there are plenty of multilane highways and other forms of car-centric land use. And while there are several miles of continuous bike lanes on streets like Price, Lincoln, and Haversham, when I visited friends there recently, I didn’t notice any buffered bike lanes, let alone protected bike lanes, which are common in Chicago. 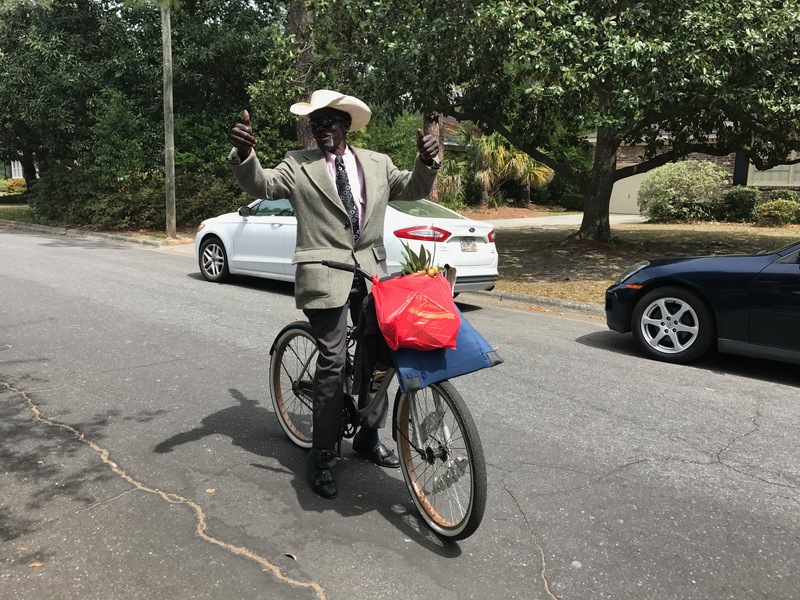 That’s not surprising since, according to a recent op-ed by John Bennett in the free weekly Connect Savannah, the city hasn’t installed any significant bike infrastructure in the last five years, whereas most of our buffered and protected lanes were built during that time. 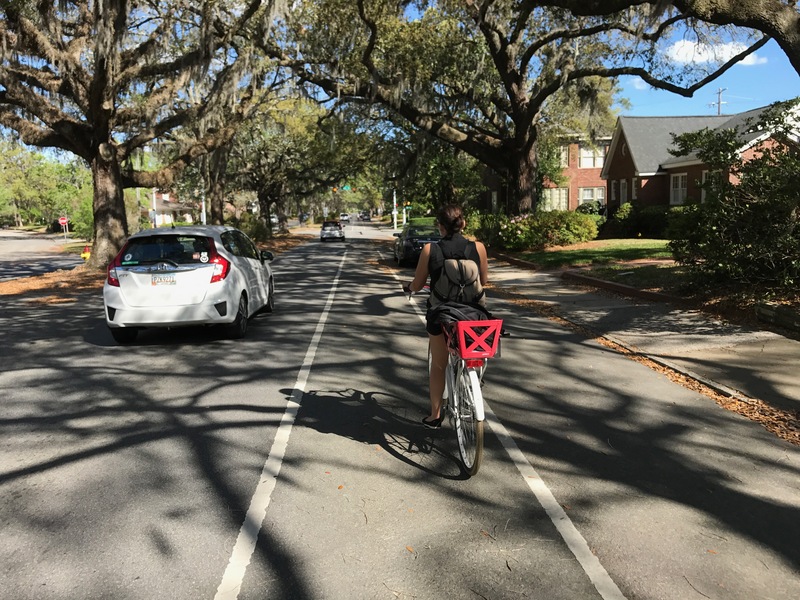 Rather, as outlined in a handy cyclist’s guide to Savannah that Bennett wrote for Momentum Magazine four years ago, the groundwork for the city’s bikeability was laid back in 1733 when founder General James Oglethorpe designed its street grid. Oglethorpe’s plan called for small parks called squares to be built at regular intervals, with each one encircled by miniature neighborhoods called wards. Just as important, the squares have a natural traffic-calming effect, since motorists are require to navigate around the squares in order to keep moving forward. They’re essentially giant traffic circles. 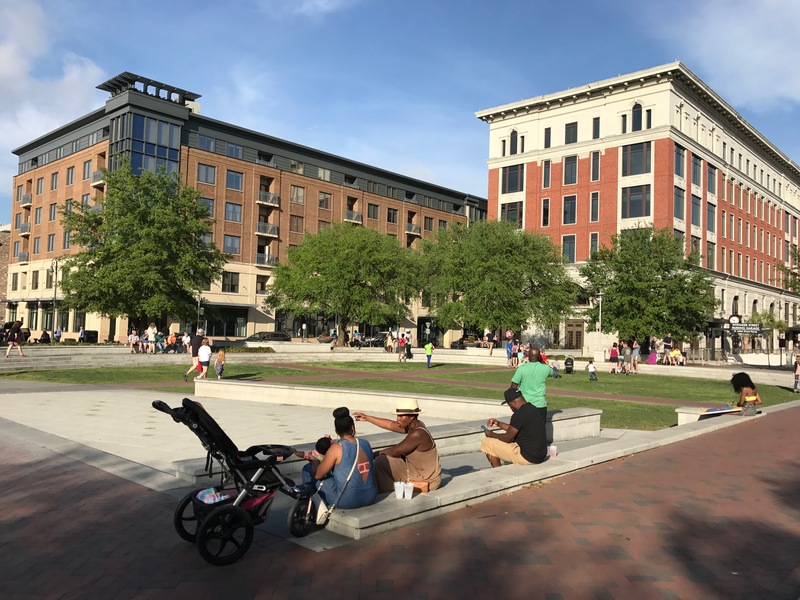 As Bennett pointed out, one of the few Savannah green spaces that didn’t survive into the modern era was Ellis Square, located west of the center of town, next to the car-free City Market pedestrian shopping district. In the 1950s, short-sighted city planners allowed it to be replaced with an ugly parking garage. Fortunately, in recent years the parking was moved underground and the square is once again a vibrant public space. The prescient 18th Century urban planning is complimented by striking architecture, since Savannah was one of the few cities that was spared during Sherman’s March to the Sea, in which Union Troops destroyed infrastructure between Atlanta and Savannah at the end of the Civil War. There are many stately homes and commercial buildings, plus several beautiful Catholic churches and the nation’s third-oldest synagogue. Savannah also has a fairly robust bicycle culture, with folks from various walks of life getting around on two wheels. Much of the bike traffic is generated by the Savannah College of Arts and Design, with classrooms and galleries spread across the city. 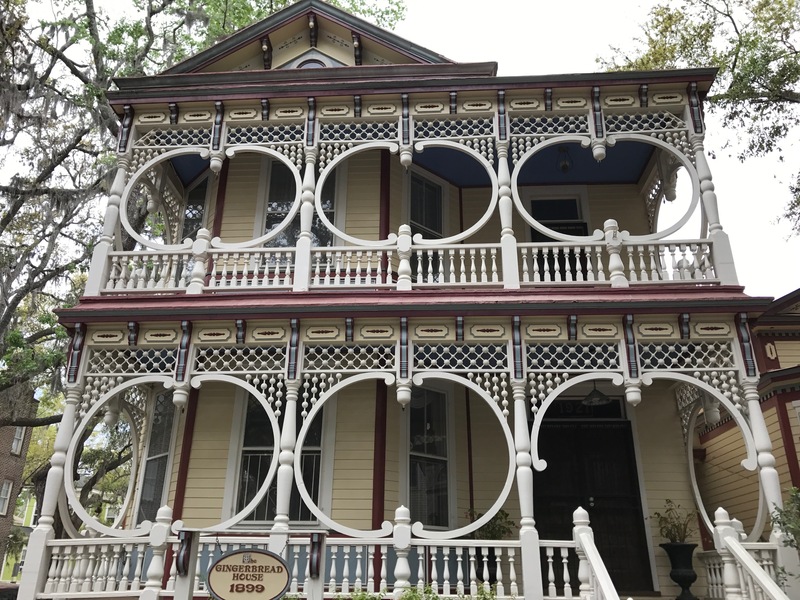 The one sour note I encountered, from a cycling perspective, is the fact that there’s no safe biking route from Savannah to the nearest Atlantic beaches at Tybee Island, located about 18 miles from downtown Savannah. The only route is a busy highway that lacks continuous shoulders, and there’s also no public bus service. Still, when you combine all the appealing physical attributes of the historic district with intriguing museums, great food and drink (try to sample some local barbecue, a Lowcountry boil, and Chatham Artillery Punch, the indigenous cocktail), and super-friendly residents, you’ve got a great destination for a bike vacation. It’s just the thing to soothe the souls of Chicagoans who want a break from the mean streets. Savannah also provides some inspiration for how we could improve the quality of life in our city with more traffic calming and high-quality public spaces. I visited several years ago – lovely, friendly place for walking and biking. I appreciated the liveliness that SCAD added to the community. The squares are beautiful – oases of shaded benches and drinking fountains, ideal for taking a break on a hot day, and enjoying a bit of people watching. Areas in and around downtown were ideal for bike riding. I sometimes had bits of spontaneous fun at intersections while waiting for red lights to change. One of those was prompted by an amusing bike jersey I happened to wear that day. I was also disappointed at the lack of non-car access to Tybee Island. There’s a lot of room for improvement there.